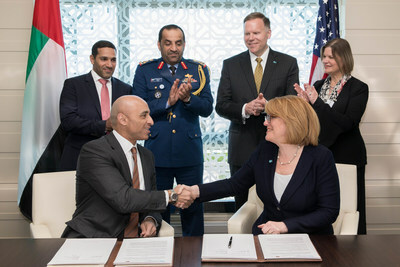 WASHINGTON, April 16, 2018 /PRNewswire/ -- UAE Ambassador to the US Yousef Al Otaiba signed memoranda of understanding (MOU) with leaders from six top US hospitals. The agreements will ensure enhanced medical care for designated Emirati patients and will provide for ongoing coordination between the American hospitals and their counterparts in the UAE. The Ambassador signed the MOUs on behalf of the Government of the UAE and Health Authority Abu Dhabi (HAAD). 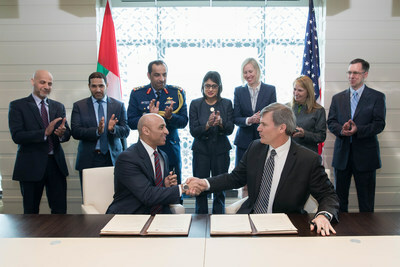 Ambassador Yousef Al Otaiba signs MOUs on behalf of United Arab Emirates Government and Health Authority of Abu Dhabi (HAAD). "These institutions provide 'best in class' care and treatment for patients," said Ambassador Al Otaiba. "Through partnerships and continued collaboration with leading US hospitals, we will not only improve access to treatment for Emirati citizens, but also help the UAE enhance its own health care infrastructure." Mohamed Al Hameli, Acting Undersecretary of Health Authority Abu Dhabi, added: "Enhancing patient experience is the main driver behind the continuous cooperation and partnerships we build in the healthcare sector. Thus we make sure that the agreements include time effectiveness and easy access to services, the key pillars to achieve patient satisfaction and happiness. The agreements open doors for further exchange of expertise, strengthening national capacities and maximizing efficiency of the healthcare workforce in the Emirate." The MOUs ensure that sponsored Emirati patients receive efficient and appropriate medical services in a timely manner. This applies to appointment scheduling, lab work, diagnostics and in-patient care. In addition to medical care, the agreements provide for transportation, halal meals and interpreters to facilitate the patients' experience in the US – as circumstances dictate. The agreements also include provisions regarding follow-up care. In some cases, this includes inviting US physicians to the UAE for further check-ups and outpatient treatment. These agreements build on a wide range of existing partnerships between the UAE and US medical institutions. In February 2018, Johns Hopkins Medicine announced a major gift from the UAE to establish the Sheikh Khalifa Stroke Institute. The Institute will be one of the most advanced centers for stroke diagnosis and treatment in the world. In addition, the Sheikh Zayed Cardiovascular and Critical Care Tower at Johns Hopkins Hospital, which opened in 2012, offers the best of patient-centered care and cutting-edge treatments.